When NBC announced last May that their next late night host would be Seth Meyers, reaction ranged from Yay, I love him to Meh to Great, another white guy. While Meyers looks like most everyone who has hosted before him, the next generation of late night hosts are quietly ushering in diversity. We just don't see it because it's coming from their writers' rooms. NBC shifted their line-up thusly: they replaced former Saturday Night Live "Weekend Update" host Jimmy Fallon as the head of Late Night with Meyers, who was also a former Saturday Night Live "Weekend Update" host. Fallon would be moving on to replace Jay Leno as host of The Tonight Show, bumping up a time slot and officially forcing Leno out of a job he'd infamously managed to take back after losing it once. In the entertainment industry, these changes were a Big Deal. Meyers is much beloved (and had been rumored to be a possible contender to join Kelly Ripa in the morning), Fallon was seen as deserving of a promotion and Jay – well Jay was getting the ending he should be getting. An opportunity to shakeup the network late night landscape, long seen as a nightly reminder of the boy's club that is the comedy world, had been missed. But behind the scenes, things have been percolating. The host changes reflected far more than a changing of the guard: they meant an opportunity for the makeup of the people who write these shows could be altered somewhat drastically. And in fact, they actually have been altered. The "dinosaurs of late night" – what more than one person women Jezebel spoke with for this piece called the many famous long-time hosts of some of the top shows – are dying out. And from that death, some good has come. In December, Splitsider drew attention to two Instagrams that Late Night with Seth Meyers producer Mike Shoemaker and writer Alex Baze had posted of the writers of season one of their new incarnation of the show. Taken as the full lineup of writers, neither depicted an incredibly diverse bunch. As is the way with these jobs, Shoemaker and Meyers hired a bunch of people who had worked together before: Peter Grosz (formerly of The Colbert Report) and John Lutz (of SNL and 30 Rock) were of iO and Second City and also once had a two-man show together. Baze was formerly the head writer of "Weekend Update," working with Meyers and Lutz on several seasons of SNL. The show's one black writer, Chioke Nassor, directed SNL's Jay Pharoah in his Kanye West parody "I Am A Dog." Ben Warheit worked on The Awesomes with Shoemaker; Shoemaker also apparently had a previous connection or admiration for Seth Reiss, who comes from The Onion and Comedy Bang! Bang! Other hires include Connor O'Malley of The Chris Gethard Show and Bryan Donaldson, hired because he's known to be funny on Twitter. Kyle Martirez-McIntosh of Arrested Development and Veep was brought on as a writer's assistant. At the time, only one female writer was on staff: Alison Agosti, whose credits include time at UCB LA, writing for The Atlantic and also being funny on Twitter. Like the rest of her coworkers, Agosti was excited about the gig; she also posted a photo of a few of the writers on her Tumblr. Later on, Jezebel reported that Meyers' had hired Amber Ruffin, who we noted was the first woman of color to be a staff writer for a nightly network late night talk show ever. Ruffin was hired along with another unnamed female writer. In weeks since that woman has been revealed to be stand-up comedian Michelle Wolf. Finally, Wolf and Ruffin were joined by UCB's Andrew Law. Law, who is Asian, won the first year of the NBC/UCB Diversity Showcase, a scholarship program sponsored by NBC that provides the winner of the competition with a year's worth of classes at UCB. Law has appeared on Late Night with Jimmy Fallon and 30 Rock. Many of the writing staff, including Wolf, Ruffin, Law Agosti and Nassor, have been prominently featured in the commercials for the show. Ruffin, Wolf and Law were added to the roster a bit after the original cast of writers was reported on; a source says the show couldn't afford to pay them all at first and speculated that they've had to play a bit of "catch-up." But no matter when they started, Meyers is doing something with his version of Late Night that no other network late night show has done: he's trying to start off with a diverse writers' room, not trying to fix the problem later, or ignoring it all together. While it's still predominantly white men, what we're seeing in Meyers' writing room is a more accurate picture of the people who are active in comedy than writers' rooms for other shows were even just a few years ago. 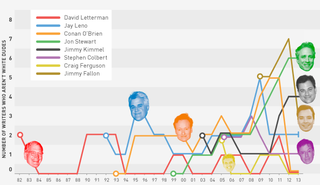 The hierarchy of late night talk shows is based largely off of A) network and B) time slot on that network. While the growing validity of cable has changed things, it can't be denied that having a prime late night slot on CBS, NBC or ABC is still historically considered the most valued commodity for a host. The ratings for these slots reflect that and reflect the subsequent coverage the shows get in the media; attention feeds attention, creating a positive feedback loop that likely increases the ratings for the shows even more. The earlier a show is on and the larger the network, the better chance it has of getting better ratings. The past month or so, as their line-up has been tweaked, NBC has dominated the ratings, especially in the advertising valuable 18-34 year old market, a fact they've aggressively promoted in multiple recent press releases. Arsenio Hall (syndication) had really strong premiere week ratings but has since dropped drastically. According to this schedule and subsequent ratings, the most powerful people in the late night world are (or were) Jimmy Fallon, Jay Leno, David Letterman, Jimmy Kimmel, Jon Stewart, Craig Ferguson and Stephen Colbert. To get a job as a writer on one of their shows is a dream job for many comedians. But historically, the people getting those dream jobs have been white men. After crunching the numbers of current and previous staff writers on shows available via IMDB, it's clear that the longer a host has been on the air and the older he is, the less diverse his writing staff is. (Information on IMDB was confirmed in some cases, but is in no way complete. The intention was to get as accurate a picture of hiring trends over time as possible, but there are surely people not accounted for.) Most shows have between 10 and 20 writers a season. Fallon, who has been on television for five years, finished his last season of Late Night with two female staffers out of eleven total that have worked for him over the years. During that time he's also had three black men write for him. Comparatively, when Jay Leno bid the world adieu, he had no women writing for him. Before that, there had only been a few in the almost 22 years he'd hosted a late night show. Statistics for men of color were not better: one black man and a couple of Latino men. Letterman's record is also not great. He currently has one woman on staff, and has never had a single black person writing for him in the almost 32 years he has been hosting either The Late Show or Late Night before that. Ferguson is the same: no women currently write for him and he only had a few do so previously, though he's been on the air for almost a decade. It doesn't look like he's ever had a black person writing for him either. Kimmel, Conan and Stewart all have middling records; while they've all been on the air for a considerable amount of time (Conan, who has been hosting shows for twenty years, is definitely more of an old-timer than he might seem) and will likely stay there, they've all hired women and men of color. A number of these writers have bounced around from show to show, just as a number of the writers on Meyers' new show have worked together before. It makes sense when you consider the way writers rooms work; because comedy writing is based so much on the ability to co-create, it's a field who you know matters perhaps even more than it does in other nepotism-heavy fields like business and finance. These jobs are also high stress and high pressure. There's not a lot of room for getting to know people quickly, but you do have to make the kind of work that will be good quickly. It's easier to jump right into things if you know the people you're jumping with. And in the comedy world, a job as a writer on a late night show is a well-paid, semi-dependable job in an industry (and country) where that can seem like a pipe dream. One female comedian – who cited her desire to eventually get one of those late night comedy writing jobs as the reason she wanted to remain anonymous for this story – said that the stability and relative 9-to-5 nature of the job allow you to do creatively fulfilling work and still "continue to have your own comedy career outside of your day job." The staff of these shows is understanding; you can go on the road sometimes or do stand-up shows at night, something other sitcom and sketch shows don't allow for. Getting a job as part of a touring company for UCB or the Groundlings doesn't make room for that work either; if you're always on the road, you don't have lose the ability to work on your stuff, she explained. The late night talk shows are less grueling than the rest of the comedy world for sure, and they have other bonuses. They're every night and they reach a broader audience of Americans. That means that when they're all lumped together, they make up a lot of jobs. Though Meyers told the Observer that he wasn't purposefully trying to diversify, sources confirm to Jezebel that that wasn't the case; Meyers was reportedly actively, exhaustively looking for women for his writers' room. Given his background, that makes sense; Meyers joined Saturday Night Live in 2001, a season after Tina Fey had been promoted to Head Writer, a position she'd stay in until 2006. Meyers and Fey were both head writers together for her last season along with Andrew Steele, and when Fey left, Meyers and Steele were joined by Paula Pell. Fey was the first female head writer of SNL since it was launched in 1975, a hiring decision that show creator Lorne Michaels told the New York Times after the fact was ''kind of risky at the time." Joined by Poehler, Fey and Poehler eventually became the first pair of female co-anchors for "Weekend Update." As noted before, Fey, Poehler, Fallon and Meyers have all cycled through spots there and Poehler will be the first guest on Meyers' show. It's not hard to speculate that working with Fey and Amy Poehler (among others), two women who have become modern titans of comedy, influenced the way Meyers sees comedy. But who the landscape has gotten better for depends on who you're talking about. "Stand-up is still kind of the last frontier [for women], I find," the veteran late night staffer said, before explaining that she feels that the race and class of those making a living off comedy gets less attention paid to it. (Many comedians have joined the writing staffs of shows after writing for old school publications like the Harvard Lampoon, a comedy magazine that recently made some historic appointments of its own as far as diversity is concerned.) "But for minority men and women, I think writers' rooms are the last frontier." Many of these shows with predominantly white writers' rooms boast diverse staffs overall. Late Night with Jimmy Kimmel! is a great example; Kimmel's co-head writer is Molly McNearney and the top power structure of the show with regards to executive producers is "basically a 50/50 [gender] split," one source noted. But the writers' rooms get attention because they're the behind the scenes talent of the show. They make the literal content people laugh at every day – they have a chance to shape and champion creative humor that caters to a wide group of Americans. The writers' room is where people work until they get their own shows: Anthony Jeselnik, for instance, used to be a writer on Fallon. The writers' room is where people work until their face is on a billboard. As the woman who dreams of writing for late night said, "The real dream isn't to write for a late night show. It's to have your own late night show some day." That sentiment was expressed recently by former late night staffer Morgan Murphy, who wrote for both Kimmel and Fallon. Currently a staff writer on 2 Broke Girls, Murphy told Marc Maron on his podcast WTF that she thought the industry was much better for women than it was when she started in comedy a decade ago. Describing the writers' room at 2 Broke Girls as "a big diverse mix," Murphy said that creator Michael Patrick King had purposefully tried to hire people who had been broke before, presumably so they could write about the feeling of having little money accurately for the show. And after reflecting on her time at Kimmel and Fallon, Murphy admitted she had found it oddly exciting at first to be the only woman writing for Kimmel, but said that when she got to work with women at Fallon, she was also exhilarated by process. Maron: And hire who you want. Murphy: Yeah. Hire your friends. For most late night shows, hiring works roughly the same way. Writers are asked to submit a packet of material, which is basically full of potential jokes for the show. A call for packets goes to the talent agencies first, which means people with representation will definitely hear about the fact that a show is hiring (if their agents like them). Though certain people are asked to submit packets, within the comedy community, word tends to get around. The submitted packets are read blindly the first time, usually by the head writer(s) of the show. They'll then pass a small pile of packets (usually less than ten) to the host of the show for him to take a look. He'll decide which ones he likes from that selection, which narrows the group down to just a few. Those people are interviewed in person and a choice is made. So while the packets are read without the gender and/or color of the person considered, the pool of applicants has typically been automatically narrowed from the start because of who has been asked to submit in the first place. Many comedians say the internet has made things way better for them in this regard. Writers are hired for shows because they've shown that they're funny on Twitter or have released an impressive YouTube series. Technology has leveled the playing field by allowing a diverse set of voices to rise to the attention of those who need to be paying attention. Hosts acknowledge this too. "I think different voices in writers' rooms are very important. I will say now, what's also getting diversified is the submissions to late night shows," Meyers said in his Observer interview. "It's not like we're going out of our way to do this. When you're looking on Twitter, and looking to see people, it would be hard not to be diverse." But technology and an open call for writers only works if those who are paying attention need to be hiring anyone in the first place. While hosts like Leno and Letterman have relatively atrocious hiring records on paper, much of that is because there just isn't much turnover in their pool of staff writers. That was especially the case with Leno; many of them barely had presences online, especially compared to their peers at shows like Kimmel or Fallon. There's a simple reason for that: they're just older. "I don't know what the makeup of Letterman is, but I would be shocked if he had someone on his staff that is under the age of 40 or 45," one former late night staffer quipped. "They're such rare jobs, they're some of the only stable jobs in the industry. It's sort of like becoming a tenured college professor." If you're an older late night host, like Leno was or Letterman is, when you started out in comedy twenty or thirty years ago, your staff represented your friends and your friends were probably white. Even comedian Beth Einhorn, who was the only woman working for Leno for three years (though was not around for the show's final season), said recently that she got the job because she knew some of the people working there already. Many of the shows, especially the more settled shows, turn over one writing job a year. (Depending on the show, many writers work on short, six week contracts that get repeatedly renewed throughout the season, making it easy to be fired if things are working.) It's difficult to start with a set of white men and end up with a diverse writing room when no one leaves – especially if there's no push to do so and there's no push to do so. Which means that even as sad as it is that a whole show of people lost their jobs when Leno left, firing people is the only way to start fresh. The first year of this show I lost my mom. The second year I lost my dad. Then my brother died. And after that I was pretty much out of family and the folks here became my family. Consequently, when they went through rough times, I tried to be there for them. the last time I left this show, you might remember, we had the 64 children that were born among all our staffers that married, and that was a great moment. And when people say to me, 'Hey why didn't you go to ABC, why didn't you go to FOX, why didn't you go...' – I didn't know anybody over there. These are the only people I've ever known. For Leno, purposefully hiring diversely would have meant firing his family. That doesn't mean that as Leno was wrapping up his time on the show, he didn't realize that he and his family wasn't quite what America (or studio executives) wanted any longer. In September, comedian Cameron Esposito performed on The Late Late Show with Craig Ferguson during an episode where Leno was visiting. After performing, Esposito was brought over to talk to the two, which in the late night talk show world is a big deal, made bigger by the fact that Esposito is an out lesbian who talked about her sexuality in her set. After joking that Leno might be a lesbian himself because of his propensity for wearing denim shirts, Leno cheered "You're the future!" at Esposito, with Ferguson applauding his declaration. "White men are on the way out! Lesbians rule!" Leno continued. Listen, I know those things happened with The Tonight Show and Conan. Those of us who are not Conan O'Brien or Jay Leno won't ever really know that full story. At the time, alternative comics like myself tended to be pretty invested in Conan's side of things. A few years later, Conan's show is going strong and Jay's about to retire again. Television is one of those industries without a ton of job security. It's a lot of up and downs and a lot of public failures and quiet successes. So I'd like to weigh in now, before he leaves late night, as saying, "Hey thanks, Mr. Leno." You were kind when you didn't have to be, quick on your feet, and genuinely funny. That stuff matters. Along with the visibility of diverse writers, the needs of the shows has changed too. While the monologue at the top of a late night episode was once considered the notable portion of the show, the popularity of Fallon's show – which relies on lots of bits, games and sketches – has convinced some network executives that that's where they should be putting their efforts. Just look at the online success of Fallon's musical bits: his performance of "Call Me Maybe" with Carly Rae Jepson and The Roots has over 17 million hits on YouTube. In the first week of The Tonight Show, sketches with stars like Will Smith, Justin Timberlake and First Lady Michelle Obama also got lots of buzz, which paid off in actual high ratings for the show. (The Tonight Show even has its own app viewers can use to submit content for given segments.) Kimmel's done the same thing, like with the series "Celebrities Reading Mean Tweets," which has cumulatively gotten around 85 million hits on YouTube. But even with lots of fun bits and stuff written with the intent that it "go viral," the voice of these shows has to still be uniform. "I think that for these shows that are hosted by one person, you need someone who can write in the voice of that person," said the former late night writer. "That doesn't mean they can't tell jokes with diverse viewpoints, but that means that if you want to be a successful person there, you need to tell jokes that they would say. They're not going to get up there and tell jokes that they don't feel comfortable saying to try to appeal to a new group of people." So while the style of Fallon's show represents a changing style of comedy late night shows, there's still a struggle to hold onto the original structure of these shows. Fallon himself has been criticized for his weak monologues, which might explain why sources say it's been difficult for him to hold onto writers who work on that particular part of the show; there's been high turnover in that position. Not a ton is known about the structure for Late Night with Seth Meyers, but what we know so far about the show's genesis indicates that it'll be more Fallon than Letterman. Bringing Fred Armisen on as bandleader is definitely a bit of a stunt push to keep things fresh and get viewers excited the way bringing The Roots on was for Fallon. According to reports, Meyers is definitely going to be more sketch comedy-oriented; he'll apparently have "characters" talk with him at his desk, characters that will likely be played by some of his writing staff. As the original late night shows evolve, the format of what makes a successful late night has become more flexible too. There's other stuff on the landscape besides the format the dinosaurs we're used to. Bravo's Watch What Happens Live! hosted Andy Cohen has between 1 million and 2 million viewers an episode. John Oliver's upcoming weekly HBO show Last Week Tonight is being produced by Tim Carvell, a former Daily Show head writer who is gay. A few women reportedly submitted packets to write for Oliver's show and at least two have been hired, though the staff isn't finalized yet and hasn't been announced. And the long-discussed Maya Rudolph-helmed variety show pilot will air as a special at the end of this season of SNL. But to prove authoritatively that things are getting better for women and minorities on late night shows outside of numbers – learning that a more welcoming culture has developed or that there have been better opportunities for career advancement – would require talking to women and minorities. And many don't want to talk. Many of the people approached by Jezebel for this story didn't want to talk, even when told they could stay anonymous. There's a fear of being considered a troublemaker in the industry, and a desire to ingratiate yourself to those who could hire or fire you. And those whose faces are out there and have to answer questions about diversity for everyone else get sick of talking about it. Daily Show correspondent Jessica Williams recently said that worrying about representing black women all the time would "stress her out." Amy Poehler has rebuffed recent attempts to discuss "women in comedy." Others have been more vocal. On Friday, Chelsea Handler published a piece on the Huffington Post about an article the New York Times' Bill Carter had written about the recent shifts in late night. In it, Handler wrote that she was sick of being "marginalized" in such articles; Carter had written "(The only female host in late-night is Chelsea Handler, 38, on E!)" when discussing the pressure networks place on hosts getting high ratings in the 18-34 demographic. "Depending upon whose research you look at, I share the distinction of having the youngest average viewership with Colbert, The Daily Show and Conan," Handler wrote. "So from a purely statistical standpoint how, in this paragraph, could I only be mentioned as an aside? Was it because I'm a woman?" "My only goal when I started this show six-and-a-half years ago was to offer viewers another voice to end their day with (even if my show is on E! )," she added. "That's the appropriate use of a parenthetical." That same week, Brian Williams issued an apology to a peeved Arsenio Hall for ignoring his show in similar piece on late night. Perhaps those who don't want to talk about these issues are frustrated because the wrong people are being asked about them. The veteran female comedy writer Jezebel spoke with recalled watching a Paley Center Panel from 2010 with several female late night comedy writers. "I remember watching the panel and nobody was really satisfied with what they were saying, but they're not really in the position to talk," she said. "They're on this panel basically given the rope to hang themselves with." "I think to be outspoken while you're in the mix is not necessarily necessary and wise," she added, citing former Letterman writer Nell Scovell's 2009 Vanity Fair piece on the lack of women in late night comedy as a better way of doing things. "I think that's why Nell is so cool, because she was out of the mix." "The people that should be talking should be the people hiring and making decisions. And so they do talk and they put their foot in their mouth and then they make changes," she went on to say. "Leave the people who are actually in the mix who are making progress happen." "The most feminist thing I can do is do my job to the best of my ability and help other women." But the people who should be asked don't want to talk either. When they do, they definitely don't say amazing things – see Jerry Seinfeld discussing how comedy can't be policed or Lorne Michaels admitting that SNL has had issues with diversity but claiming that "show business [is] clearly in the lead on diversity—way before sports, way before business, way before educational institutions, way before newspapers, way before almost anything else." Michaels made those comments right before a fresh study from UCLA was released this month which notes that in Hollywood, "the proportion of female and minority actors, writers, directors and producers in films and TV ranges from just one-twelfth to one-half of their actual population percentage." Staffing turnovers and the needs of the industry will only go so far to broaden opportunities for women and minorities to get the jobs long held by white men. Industry "gatekeepers," like bookers on shows or at comedy clubs, talent agents and network executives ultimately make the call over who to promote and who to ignore. Even those who wouldn't be considered all that powerful – like people running their own shows or open mics – have the ability to propel someone forward. When they're not interested in including diverse voices, it makes the pipeline even longer for anyone who isn't a white man. And then you end up with something like Comedy Central's just-announced 2014 list of 30-minute stand-up specials for their series The Half-Hour. It has two women and three black men on it. The rest of the 15 people are white men. "Late night does feel a little bit like a dinosaur," the veteran late night staffer admitted, but it's not that much worse than the rest of the comedy scene. And more importantly, it doesn't seem to be going anywhere. Though the ratings for late night talk shows aren't what they once were, and though some believe that networks will start to cut back on the shows of this format as a cost-cutting measure, as New York magazine's Josef Adalian has reported, few believe they will totally go away (at least not in the near future). "They're these cultural touchstones, for better or for worse," the former late night staffer said. "They have that sort of permanence that so few things have on TV, which is I think why they get all this attention, even if they're not necessarily the biggest drivers of what's on peoples minds." "It's sort of like cable news that's on in the background," he added. "It's always there." No matter what it looks like behind the scenes. Images via Getty. Chart by Reuben Fisher-Baum and Jim Cooke.